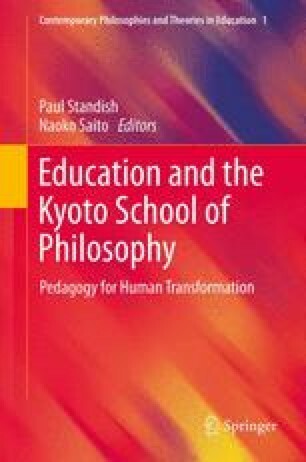 In this chapter, ‘Philosophical Anthropology and Post-war Pedagogy,’ Satoji Yano attempts to trace and clarify the development of the anthropology of the Kyoto School, specifying its inception in the pre-war period under the influence of Kitaro Nishida and Hajime Tanabe and its post-war maturation. This anthropology was developed in Japan through an actively critical re-reading of Heidegger, in the course of Nishida’s and Tanabe’s philosophies and through their wider influence. The Kyoto School found its unique path of development as a dialectical anthropology, based upon an ontic-ontological understanding of the human being as a historical and social agent. More specifically, it was a distinctively Japanese anthropology, whose focus was on community, nation, culture, body, race and history. An anthropology of education based upon the Kyoto School directly contributed to the development of education, though this ended up more in service of the nationalistic, spiritual movement of the times than as a realization of its philosophical inspiration. The pedagogical anthropology that was established at the end of the Second World War has left much unsaid, whether consciously or unconsciously, in respect of its continuity with prewar and mid-war thinking about education. Yano argues, however, that prewar and mid-war pedagogical insights have been inherited in a variety of ways by studies on pedagogy in the postwar period.